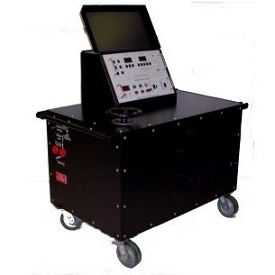 The ETI PI-6000 Mobile Circuit Breaker Test Set is a versatile and technologically advanced primary injection test set capable of testing circuit breakers up to 6000 amperes frame size. This test set will test low-voltage, molded-case and metal-clad, direct acting AC circuit breaker from various manufacturers. The test set can also be used on high current applications like ratio transformers, and heat runs.